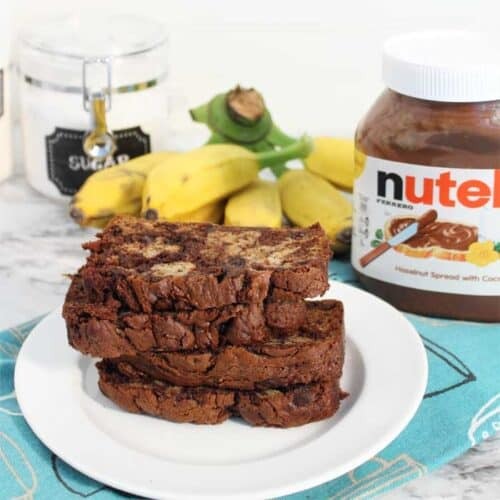 This sweet, delicious Nutella Banana Bread has everything you love about banana bread with a surprise inside, Nutella! Great for breakfast or dessert. Preheat oven to 350 degrees. Spray an 8-1/2 x 4-1/2-inch loaf pan with a non-stick cooking spray, then dust with flour. Or opt for mixing 1 Tablespoon melted butter, 1 Tablespoon vegetable oil and 1 Tablespoon of flour together and brush on pans with a pastry brush. It works great on uneven surfaces like a Bundt pan too! In a large bowl, combine the 4 dry ingredients together. In another bowl, mash bananas well and combine with eggs and oil. Add to dry ingredients and mix until well combined. Divide the batter in half into 2 separate bowls. Combine 1 bowl with Nutella. Note: You can soften Nutella before adding by placing in the microwave for 10 seconds. Combine the other bowl with the nuts or chocolate chips, if desired. To assemble bread, drop scoopfuls of batters alternately in prepared loaf pan. Using a knife, swirl the batters together to create a marble effect. Bake for 60-70 minutes, or until a toothpick in the center comes out clean. Let cool in pan for 15 minutes on wire rack, then invert onto rack to finish cooling. Once cool, you can add the chocolate glaze below if desired. Place chocolate and butter into a microwave safe measuring bowl and melt in microwave in 30 second increments until chocolate is almost completely melted. Stir until all chocolate is melted, then add powdered sugar and hot water. Mix well. If the glaze is too thick, additional water may be added 1 teaspoonful at a time. Spoon chocolate glaze over the top of the bread and let drip down sides. Let sit until set.